As the backlash on Twitter showed no signs of subsiding, the Ministry of HRD issued a statement clarifying how Jio Institute came to be picked. It clarified that Jio Institute was chosen under the greenfield category. Tripura CM Biplab Deb as the Science teacher, a gaushala as the science lab, Asaram, Gurmeet Ram Rahim Singh and Radhe Maa as visiting professors, Jay Shah as the Accountancy professor, a degree in Jiology, Jiography and ENTIRE Political Science, and jobs awaiting for the graduates at the BJP IT Cell - these are only a few of the charms of Jio Institute, as Twitter would like you to believe. On Monday when HRD minister, Prakash Javadekar, announced that the Ambanis' Jio Institute has been selected for the status of 'Institution of Eminence', Twitterati cracked their knuckles and did what it does best - take digs and make jokes. More importantly, because Jio Institute, now at par with IIT Delhi, IIT Mumbai, IISC Bangalore and BITS Pilani is yet to be set up. Seems unbelievable? Twitter thinks so too! So, it took some amount of creative freedom and reimagined how Jio Institute would look like. News of Jio Institute's rise to eminence even before its existence created an uproar on social media. Netizens not only took digs at Jio Institute, Ambanis and the Modi government, who they believe are colluding to thrust the institute to the top, they also questioned the legitimacy of the four-member expert panel's decision. Jio Institute that will have Nita Ambani at its helm will be set up by the Reliance Foundation, Reliance Industries' philanthropic arm. 1. An IoE should offer interdisciplinary courses and carry research on "areas of emerging technology." 2. It should have amenities comparable on the levels of globally reputed institutions and should have a mix of Indian and foreign students. So, netizens lost no time in criticising the decision to bestow the IoE tag on Jio Institute. Was it fair to club the institution that does not even exist with exemplary ones such as IIT Delhi, IIT Bombay, IISC Bangalore, BITS Pilani and Manipal Academy of Higher Education? 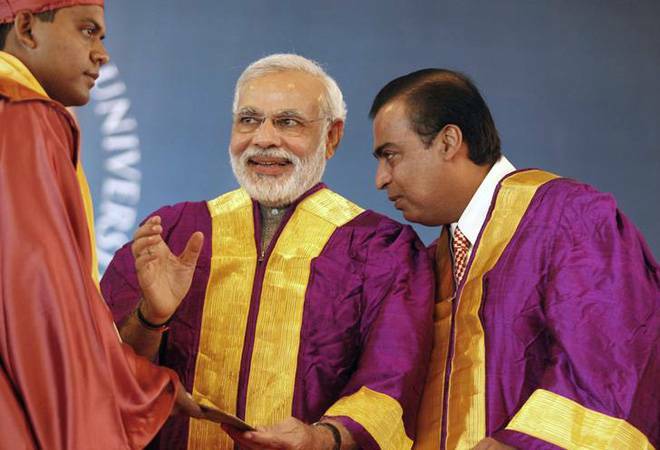 Why pay Reliance Industries belonging to the richest man in India Rs 1,000 crore when that money could very well be spent on other institutes? Were other applicants with poor track record bypassed for Jio Institute with no track record? And hence, netizens set to work. Its not that #JioInstitute doesn't exist..
Its just that we dont have enough data on Jio Institute. #JioInstitute being India's institute of eminence without existing makes total sense. Which is the best school of wizardry? Hogwarts right? But muggles cant see that either. I'm sure its the same with Jio. We're all muggles! As the backlash showed no signs of subsiding, the Ministry of HRD issued a statement clarifying how Jio Institute came to be picked. It clarified that Jio Institute was chosen under the greenfield category. "The purpose of this provision [for greenfield institutions] is to allow responsible private investment to come into building global class educational infrastructure, thereby benefiting the nation as a whole," the ministry said. The amount of Rs 1,000 crore is also to be given to only the public institutions. 3. Strategic planning for their vision with an action plan and annual milestones. 4. A core team with "very high qualification and wide experience". "The Committee has come to a conclusion that out of the (11) applications, only Jio Institute has satisfied all the (4) parameters stated above, and hence was recommended for issuing a Letter of intent for setting up an Institute of Eminence," the ministry's statement said.